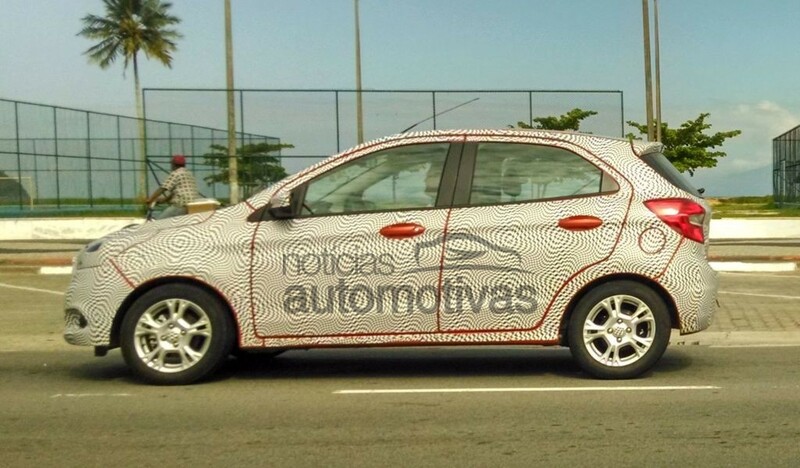 After vigorous testing, 2015 Ford Figo (Ka) hatchback is caught in Brazil in the most undisguised avatar ever. Just few days before Indian Auto Expo’14 Ford unveiled a ‘Figo concept’ of Ka based sedan. Ka hatch is the donor car of this sedan. 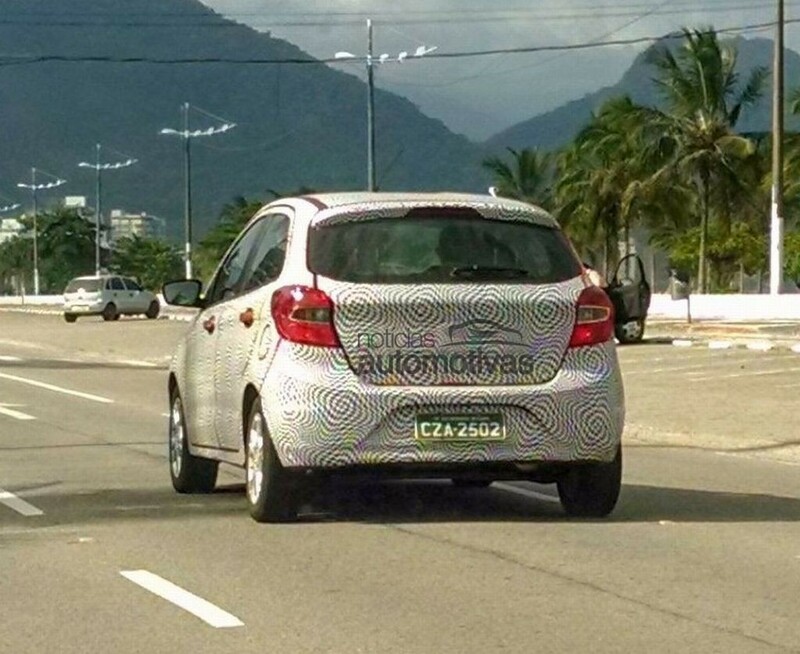 Spy images flaunt Ford’s new design of trapezoidal grill like Aston Martin synced with headlights identical to Hyundai’s fluidic design. While both test mules carried different alloys, wheels looked 14 inched. These will be a boost in ground clearance as compared to its older sibling Figo. Ford Ka will replace Figo as the outdated designed Figo needed the necessary update. 2015 Figo platform is called B562 is based on the Mk5 Fiesta platform. 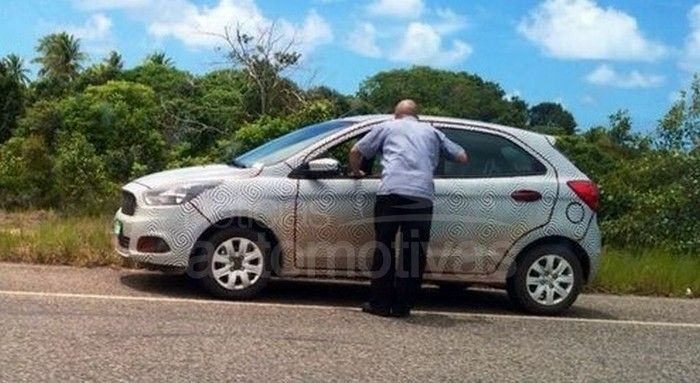 After unveiling Ka based sedan, it is expected that Ford will bring Ka hatchback soon in the Indian market. The car will be placed in B+ segment and will compete with Tata Bolt, Hyundai i20, Fiat Punto. Ka is expected to carry features like SYNC infotainment system and push button start/stop that can be seen on EcoSport. With Tata bolt offering the best in class features like driving modes, 15-inch alloys, it will be interesting to see how the American Engineering excellence compete against Indian Automotive Giant. New Ka hatchback will be powered with 1-liter turbocharged direct injected Ecoboost engine and in diesel engine option a 1.5 liter oil burner will do the duty. The same diesel mill is already powering new Fiesta in India and Ford EcoSport. The tiny 1 liter 3 cylinder turbocharged petrol motor pumps out 123 bhp and 170Nm of flat torque and the 1.5 liter TDCi pumps 89 bhp with 204 Nm of maximum torque. The company also plans to bring in Ford KA based compact sedan which was showcased in 2014 AutoExpo as ‘Figo Concept’. Ford has a lot of hope for 2015 in India with new Figo, Figo compact sedan and new Ford Endeavour. A minor facelift is also in plan to Ford EcoSport with integrated DRLs in headlamp unit and more funky colours.